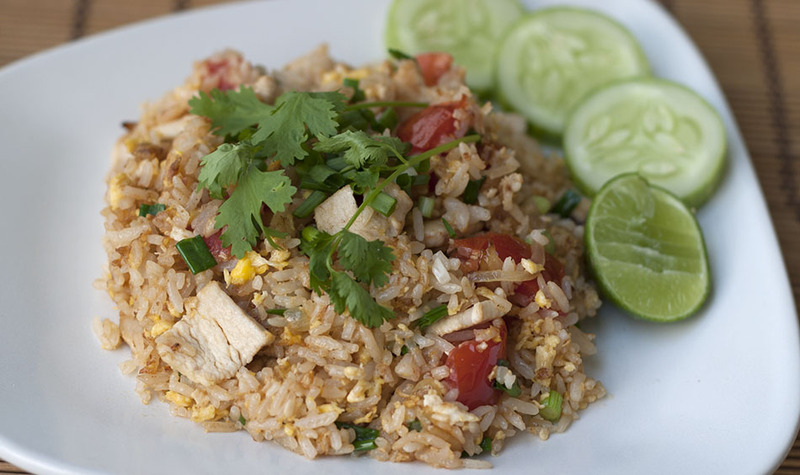 Thai Fried Rice with Chicken (khao pad gai – ข้าวผัดไก่) is a very easy dish to make, and a great way to use up leftover rice. Prepare all your ingredients: chop the tomato into medium-sized pieces, slice the onion into thin strips, finely chop the garlic and chop the scallions. Slice the cucumbers and chicken. Heat the oil on high until hot. Add the onion. Stir well and when it’s softened add the garlic. When the garlic is slightly browned add the chicken. Stir well. Keep flipping the chicken until it’s white on all sides. Add the rice and stir well. Add the tomatoes and mix. Push the rice to the side of the pan and add a bit more oil. Crack an egg on the oil and mix in the pan. Let set. When solid, flip the rice on top and mix well. Add the soy sauces, sugar and salt. Turn off heat. Add 1/2 of the scallions and white pepper powder and mix well. Turn onto a plate and garnish with the rest of the scallions, coriander, a piece of lime and the cucumber slices. 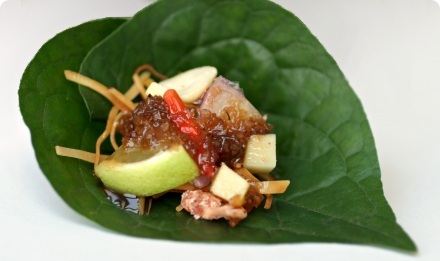 Serve with a small bowl of fish sauce with sliced chilies (prik naam plaa). For vegetarians - try veggie meat or fried tofu pieces with the rice, or just leave out all together. Chinese Broccoli is also good in this dish. Cut into small pieces and add after the meat. This recipe needs some serious revision. There’s no mention of the amount of oil that you need in the ingredients, and it lists Coriander as a garnish instead of the cilantro that’s mentioned later in the instructions. Plus, the tomatoes are never mentioned in the instruction. When should they be added? I’ll still be trying to cook this tonight, doing it the way I think it should be done, but this really needs some revision. Hi, I tried this recipe and I had similar problems: I got to the end and I still had the chopped tomatoes right in front of me. What I did was to put the tomatoes in, combine the lot and let it rest, away from the heat. Apart from this it says 1 cup of rice (a day old), what it doesn’t say is that it has to be boiled rice. As far as the amount of oil is concerned I always add the amount I think I will need – it’s only practice. I sincerely hope this has assisted you. I have added the tomatoes to step three. Thank you for pointing that out. I also clarified that the rice should be pre-cooked. The amount of oil is up to you, 1-2 tbsp should be enough. Coriander and cilantro are the same plant – Americans call it cilantro (Spanish name) and English/Australians, etc call it coriander. What Americans call coriander is the seed of the same plant. I have added the tomatoes in step three. Coriander and cilantro are from the same plant but they are not the same thing. Coriander is the seeds and cilantro are the leaves. They don’t taste the same either. Coriander & Cilantro are the same thing. Americans refer to the leaves of the plant by the Spanish name, Cilantro, and refer to the seeds by it’s English name, Coriander. The seeds, leaves and roots all have a different taste, which is why this plant is so useful in the kitchen. JFargo needs to chill out. I really liked this recipe! It tasted better than the thai restaraunt we go to. The only thing I changed was that I added more soy sauce than asked for. Definately worth making, and pretty easy! Ray, one day you will work out that a really well prepared recipe sets out in detail how and when all ingredients are used and is consistent in their naming. There are many websites where this recipe in its current form would not have got past the moderators. Please get your brain in gear before you start abusing people – then you may see that JFargo had a valid point. This website is a non-profit site run by two friends. We do it on our day off, and don’t have any moderators. We try to keep our standards high but don’t have a whole lot of time to work on this project. apparently some people do not have a brain. recipies are just guidelines to get a person started. Personal choice plays a large part in preparing something that will be enjoyed. who cares whether Coriander & Cilantro are different or the same.. experiment. People that posrt recipies keep it up they are merely food for thought and jumping off places for preparing something different. Thanks Cee. JohnMich also needs to chill out. Does this look like a world renown culinary arts teaching site? Did you pay for this recipe? Are you going to cook fried rice based from this recipe for a group of people without testing it first? This is a great site for people who want to try to learn to cook Thai food. It’s not perfect, but it doesn’t warrant snobbish remarks. So, like ray said, chill out and just read the recipe. You’ll get it if you try. I make Thai fried rice at home all the time and had one major issue with this recipe – the omission of the all important nam pla (fish sauce)! Fish sauce is the cornerstone of Thai cooking and is the primary flavor in any Thai fried rice (and is found in almost every single Thai dish). Also, I think too much soy sauce was called for in this recipe. I use extremely little just for taste. Anymore than just a dash makes it too salty (and too Chinese). For those who were asking when to add the tomatoes, in all of my experience in Thai fried rice, the tomatoes are only garnish usually sliced and served on the side. In many cases, the tomatoes aren’t even eaten although I make my kids eat it. That doesn’t mean you can’t add it to the fried rice itself, I just never personally seen it that way in Thailand. Thanks for your comment. I was taught to make this recipe the way which is posted here, but there are hundreds of variations on this recipe. If you prefer to cook with fish sauce, then go ahead! Hopefully soon we’ll be able to start posting recipes again and will include a few more fried rice recipes. Thai Girl…thank you, I was wondering why there was no mention of nam pla. I am half Thai, myself, and while I’ve always made Thai fried rice as I learned it from my Thai father, I always feel like something is missing compared to the fried rice I’ve had in Thailand. Is the white soy sauce necessary at all? Also, I’ve never used the white pepper powder the recipe calls for. Does anyone know if that makes much of a difference? Thanks. Instead of white soy sauce, I use a small splash of dark soy sauce (for the salt) and sweet sauce soy for added flavor and a little color (using sweet soy sauce is something I started doing recently for variety, which tastes really good). I never use white pepper – all it does is give it a peppery taste. I actually don’t use any type of pepper. This recipe tripped me up on the oil as well so my rice was a bit oiler at the end than I would have liked, but it was still really good. I put the tomatoes in after the chicken and rice, and then the green onions last. It all worked out. And, since I was out of crushed red pepper, I used some Mrs. Dash Salt Free Fiesta Lime seasoning and it really kicked up the lime flavor too. Deeelish!!! I’m not sure whose recipe this is but after all the reviews I decided to comment. My husband and I LOVE Thai food. We wanted to make our own thai food at home because it seemed so simple just by what we would order from the restaurants. We found this recipe and were very excited that everything the recipe called for we had in our fridge. We made it that day, rice was cooked the same day. It came out great, we love it, our kids loved it. We have made Pad Thai before and used the fish sauce and weren’t too fond of it. We know that fish sauce is a staple in Thai food but for my family we will leave that to the restaurants to use. I think your recipe is great. We are having fried rice for dinner tomorrow only this time I have already cooked the rice. We can’t wait! Thanks for such a simple recipe! What you have done with the fish sauce (leaving it out) is perfect. I prefer it with the fish sauce, however every single recipe I get my hands on I change it according to my taste, si if for instance there is a recipe that contains lard (I love it, but it’s just fat, not good for you) I replace it with olive oil: it tastes the same, it has the same effect but it’s not pure fat. Love this recipe. Making it for the second time today. I also add thai basil leaves since it grown in my garden and adds such amazing to he dish. There are many variations on how to cook a certain recipe. So, to those who are so loud… just put your brains together and make a twist on this recipe to suit your palate. I must admit, I had a giggle at the comments. Recipes should be a guide only. The beauty of cooking is that you can put as much or as little of anything you like in there to your own tastes. This recipe is a great starting point for anyone who’s never made this dish before, with the freedom to add or subtract whatever they like. Including myself, we have a family of five and it makes enough for us all. Now we do add extra ingredients just because we like to have seconds. The first time I made this we made it as the recipe called for and it was plenty. Good Luck! I’ve been to Thailand numerous times and one thing ive seen and lived and learned is THAI FRIED RICE HAS FISH SAUCE…even a tiny bit. without it it is chinese fried rice. Im not asian and i can tell the extreme difference. Saying “well, i do it this way..and you can make it your way” doesnt work. That is like making a pizza without dough tomato sauce or cheese. Thai food REQUIRES the nam pla just like certain French dishes require butter whether you like it or not. Adding a Thai name will not make it Thai ..the problem with many folks is that they do not know how much nam pla to put…too much (and that can be one drop more)yes, it will be pungent. A teeny bit goes a looooong way. Pizza without tomato sauce, oh my! (it’s great!) and the crusts can be cornmeal or bagels etc. Open your mind and learn to cook!!!!! I can rarely follow a recipe to the “T”, I live in the Caribbean and we don’t have all the ingredients, I made a great sauce out of ketchup, johnny walker and sugar and nobody complained. BTW this is French carib. and we don’t ALWAYS use butter. first i am not thai or asian..but..I agree with you 100%….i find recipes all over the web claiming to be Thai yet they omit nam pla. Ive been to Thailand many times and if it doesnt have nam pla ..it is a chinese dish. MAny sites just want to cater to ‘sensitive’ tastes..without realizing that all the dishes have the fish sauce even in a seemingly teeny tiny amount…but that amount omitted will make the difference. A friend in NYC tried making thai dishes but never got it “right” as he said…and also added but i dont like fish sauce. I mentioned to not put the amt. he THOUGHT it should have..but i tiny almost non-existant amount and VOILA! magic happened….the dishes now taste real and he says he doesnt even notice the nam pla flavor. Fish sauce is like Vanilla extract…one tiny drop makes the dish…2 drops ruin it. Learning does not only take place in instructions. It takes practice, time, and learning at own our different directions. If there is something that is missing from instructions above, politely ask. Internet; it’s where people could be so rude. The guide is well done. The website design looks quite neat! You did a great job. Fried Rice is very easy to make, there shouldn’t be any complications. Great recipy we loved how it tastes.We are a family of 5 and it was great…! Great work, Cee, and thank you for all of your patience with us. As Chiu said, we are learning all of the time. It’s wonderful to have the internet where most questions can be answered. When I don’t understand something, I type a simple question in my browser window, such as “What is coriander?” or “What is quinoa?” and I can learn a great deal. I’ve also visited youtube quite a bit lately where I can see videos of cooking methods. I’m 69 and still learning! So many resources on the internet……. Firstly, I would like to thank Cee and his mate for having created and kept this site, it’s great!. What I would like to do now is to speak about just a small part of Thai cooking: coriander (cilantro in spanish) a bit. The first problem I always encountered was how to keep cilantro without rotting – you go to a vegie shop, by a bunch, take it home and use a bit. Withing a day is wiltering like you wouldn’t believe and by the end of the week what’s left you probably have to throw it away because 80% of it’s rotten! So, and because I had nothing to loose I firstly washed it thoroughly, chopped it all, [except the roots which I discarded] place content in a freezing bag and into the freezer with it. I tell you what: it’s been a total success, each time I need some I go into the freezer and pick up what I required for my cooking: it doesn’t rot, it doesn’t go hard and the taste has not been compromise! Secondly, I no longer throw away the roots: they are the tastiest part of the plant! To keep cilantro/coriander longer, I recommend washing the bunch well and placing in a glass of water inside your fridge. When the water turns brown, take the bunch out, rinse it, discard any bad bits and refresh the water. I can usually get about 2-3 weeks out of a bunch that way. I was just about to post the same thing, Cee. I keep my glass of cilantro in the refrigerator door so it won’t get knocked over. It’s so nice to have it greet me as I open the door, and it’s a reminder to check on it. Thanks for showing the beautiful picture of the fried rice. Few days ago I have tried up the Tomyam fried rice.It tastes very delicious and husband get hooked on the Thai fried rice. We will definitely try this recipe very soon. Just to give a brief opinion regarding the issue about fish sauce (nam pla). You can’t alwayls take it for granted how much you should add nam pla in the food , this is because different sort (brands) of fish sauces are not the same.Some brand are very saulty and the other are less saulty. Cee: I agree wholeartedly with your comments on experimenting. This is somenthing I do quite often, not only with Thai cuisine, but with just about everything I cook. For instance the other day I cooked some chilean pasties (empanadas), the traditional recipe calls for mince meat, I replaced the meat content with tuna and the result was fantastic!